Bramley's Seedling is the definitive English "cooker". However it is an extremely vigorous variety, producing a tree that is substantially larger than all other apple varieties (only Blenheim Orange comes close). Bramley 20 is a sport of Bramley's Seedling which happens to produce a tree which is naturally about 20% smaller, making it more suitable for the garden. 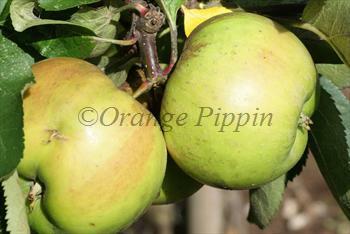 Bramley 20 is a valuable alternative to the regular Bramley's Seedling at both ends of the size scale. You can use it on dwarfing rootstocks, allowing you to grow Bramley apples in a small space. You can also use it on semi-vigorous rootstocks to produce a free-standing tree which is still not too large. Another advantage is that if you are planting several apple trees together, you probably want them to be about the same mature size on any given rootstock. A regular Bramley's Seedling will become much larger than the others whereas Bramley 20 will have similar proportions to the other trees. Although the tree is smaller, the apples are the same size as the regular Bramley's Seedling. Please fill in the details below and we will let you know when Bramley 20 apple trees are back in stock. Bramley 20 is in flowering group 3. 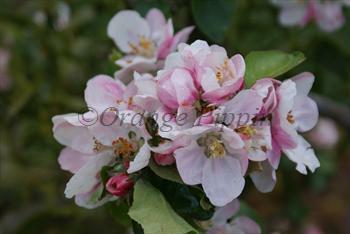 Bramley 20 is a triploid variety and cannot pollinate other varieties. It needs to be pollinated by another tree of a different variety nearby. You can either plant a self-fertile variety (which will pollinate itself and the Bramley 20) or you can plant two pollination partners which must each be of different varieties and able to cross-pollinate each other as well as the Bramley 20. If you need further advice on this just get in touch. Since it flowers in the middle of the blossom season it can be pollinated by most other apple trees. Bramley 20 retains most of the horticultural characteristics of Bramley's Seedling, but produces a tree approximately 20% smaller on any given rootstock than Bramley's Seedling. It is quite easy to grow but like Bramley's Seedling it is a triploid and needs 2 separate compatible pollination partners although in most suburban environments you can usually assume there will be suitable varieties in the neighbourhood. See our page on Bramley's Seedling for more details of suitable pollination partners. The pink-flushed white blossom is prolific and attractive. The fruit ripens late in the season, and stores very well. Developed in the UK in the 1970s, a compact sport of Bramley's Seedling.